Following an intensive 10-year development program, British diesel engine innovator, Cox Powertrain, reveals the final concept of its highly-anticipated diesel outboard engine, the CXO300, at Seawork International. The launch of the new diesel outboard is set to be transformational for the marine industry. The long-awaited engine will begin production in Q2, 2019 with order books opening in November this year. The final concept of the CXO300 is based on the proven technology of a 4-stroke, V8 architecture. It is the world’s first 300hp diesel outboard engine ever to have come to the marine market and will deliver many advantages over competing gasoline outboards. 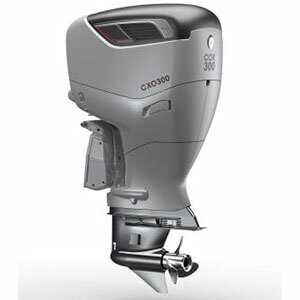 Crucially for commercial operators, it offers at least a 25 percent better range compared to a gasoline outboard and is designed to last up to three times longer. It has a 100 percent higher peak torque at the crankshaft than the leading gasoline 300-hp outboards and is 60 percent higher compared to a leading 350-hp. This enables the craft to move more weight more efficiently, reach peak torque and top power more quickly. Users of equivalent powered diesel inboards will greatly benefit from the flexibility of installing such a robust commercially graded diesel outboard engine. The CXO300 will deliver a package volume around half that of a state-of-the-art diesel inboard with comparable fuel efficiency. Benefits of reduced maintenance and haul out costs, minimised disruption to operation for engine service and repairs will be a big advantage. The CXO300 has been designed and developed in-house from the ground up for professional maritime use in collaboration with Ricardo, one of the world’s leading engineering and environmental consultancies. In a relationship that has lasted for ten years, Cox’s highly skilled team of engineers have worked closely alongside Ricardo to deliver an engine technology that will be transformational for the marine industry. Ricardo is highly regarded for its expertise and knowledge in areas such as strict emissions legislation and other environmental regulations in this sector. Sea trials of the CXO300 will commence in October this year and order books will open in November. The engine will go into full production in Q2 2019. For more information, visit Cox Powertrain, who is joined by UK distributor Berthon, on stand PY65 at Seawork International. Demonstrations of the final concept CXO300 will be given via an interactive app. A copy of the final technical specification is also available on the stand to take away. To stay up to date with the latest news and progress, visit coxmarine.com where you can sign up for Cox Powertrain's newsletter.